Healthcare.gov has updated the data on health and dental plans in the federally-facilitated and partnership marketplaces, providing a more complete picture of of the cost of pediatric dental coverage under the Affordable Care Act (ACA). 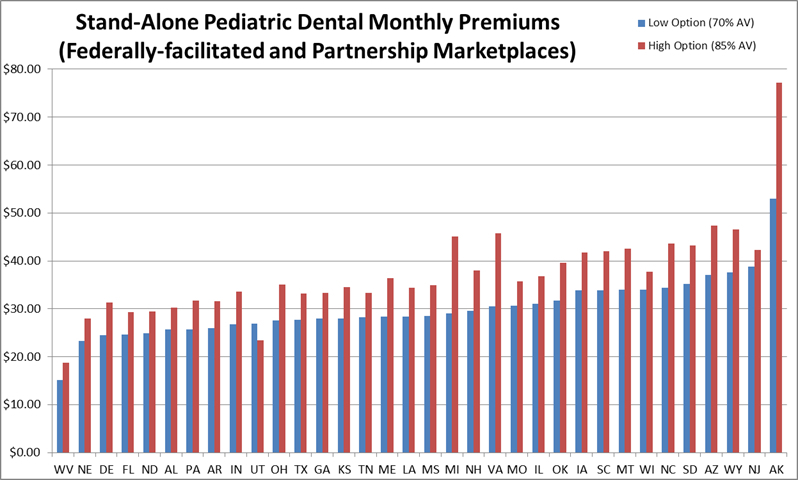 Shortly after enrollment began last October, CDHP averaged the premium rates for the low and high option stand-alone pediatric dental products in each state for which federal data was available. At that time, Wyoming's stand-alone pediatric dental products were the most expensive among the federally-run marketplace states while West Virginia was the least expensive. New analysis now shows that stand-alone dental premiums are most expensive in Alaska, with low option plans (70% actuarial value) averaging about $53 per child per month and high option plans (85% actuarial value) averaging just over $77 per child per month. West Virginia's premiums remain the lowest with low option plans averaging about $15 per child per month and high option plans averaging just under $19 per child per month. The national average among stand-alone pediatric dental plans in the federally-facilitated and partnership marketplaces is about $30 for low option plans and just over $37 for high option plans. In many states, pediatric dental coverage may also be purchased through medical insurance plans. Stay tuned for further analysis from CDHP.